Detectoy 2L Watering Sprayer Bottle Gardening Atomizer Tool Big Capacity Safe and Durable Material Water Cans Adjustable Nozzle Droplet by Detectoy at The Mirror Project. MPN: Detectoy. Hurry! Limited time offer. Offer valid only while supplies last. It can also be used for disinfection and cleaning fluid. Perfect for watering garden plants outside and in and cleaning windows. MULTI PURPOSE DESIGN - Easy to Adjust, Rotate to change the sprayer mode. Perfect for Spraying Neem Oil, Misting Veggies, Gardening, Cleaning, Automotive, Pest Control. TRANSLUCENT DESIGN - Translucent graduated bottle in liter and gallon for accuracy when filling, or mixing within the bottle. INNOVATION DESIGN - Thicken body, Automatic pressure release design, Bold bar, Gaskets seal, Special pump bar, 2L handy Spray Capacity. 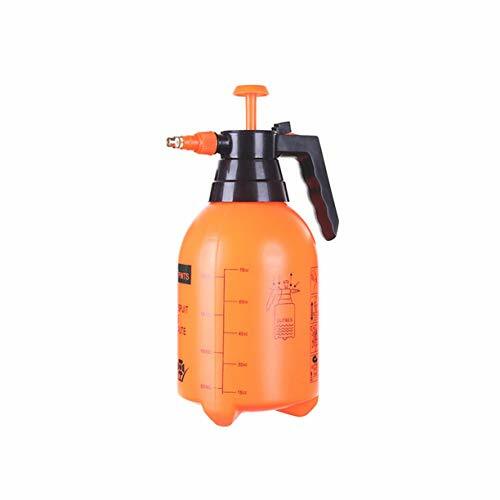 HIGH QUALITY MATERIAL - Damage Resistant Plastic Body Mean Sprayer Lasts Season After Season. Plus Chemical Resistant Seals Prevent Leaks and Problems Common with Low Quality Pressure Sprayers. HUMANIZED DESIGN - Wide mouth makes this bottle easily fill in water and arthritis-friendly easy grip handle make continuous spraying less straining. After exceeding the safe pressure range, the safe valve will be automatically discouraged to prevent burst.